We are the Waterstrats (Ford, Amanda, Finley, Silas and Josiah) and we invite you to get to know us as you enjoy our seasonal harvests — certified organic, from our family to yours. Sustainable Harvest Farm is the culmination of years of dreaming, planning and praying by Ford and Amanda. This is our story of how it all began. Ford Waterstrat was born in Seattle, Washington and his family lived in more than 15 homes during his childhood with locations ranging from Lasqueti Island, British Columbia, to Maine and Mississippi. Although his parents were not farmers, they have always been champions of the environment. Ford credits his fascination with farming to his parents’ passion for protecting the environment and his mom’s ability to create beautiful outdoor spaces as a talented landscape architect. Ford’s journey to Kentucky began in 1999. While competing as a professional cyclist in New England, Ford was recruited to the cycling program at Lindsey Wilson College in Columbia, Kentucky. There he earned a bachelors degree in education and met the love of his life — Amanda. Amanda is a Kentucky native who was studying biology with plans to pursue a career in science. But the two would soon set out on an entirely new journey together as they began to dream of a life in rural Kentucky, farming and growing their own food. Sustainable Harvest Farm grew out of this dream and their mutual love of the outdoors, wholesome food, environmental stewardship and rural community life. In 2005, Ford and Amanda married and settled into their first home in Georgetown, Kentucky. Ford spent his days teaching and Amanda pursued a Ph.D. in Physiology at the University of Kentucky. On his break from teaching, Ford picked up a summer job and Amanda says he fell in love for the second time — this time with farming. The Waterstrats lived across the street from one of Kentucky’s premier organic farms — Elmwood Stock Farm and Ford became a farm hand here in 2006. Ford continued to work for and learn from the Bell family until the dream of establishing his own farm materialized in London, Kentucky. In December 2009, the Waterstrats moved to their current home in London, Kentucky and began selling produce at the local Farmers’ Market the following summer. In 2011 they offered Sustainable Harvest Farm’s first Community Supported Agriculture (CSA) program and became the first USDA-certified organic farm in the region. By 2013 they expanded their operation to include grass-fed beef and pastured pork. They will introduced the regions first customizable CSA in 2018, allowing customers to select what and how much goes into their weekly produce shares. They continue to look for ways to innovate and expand their farm to provide high-quality, sustainable food to their CSA members, Farmers’ Market customers and friends. As the farm has expanded, so too has their family. Ford and Amanda welcomed the arrival of their oldest son, Finley in 2010, and were blessed again in 2013 with his twin brothers, Silas and Josiah. They enjoy teaching their children the joys of farming and rural living. The Waterstrats say they are sustained themselves by the loving support of their family and local church community. 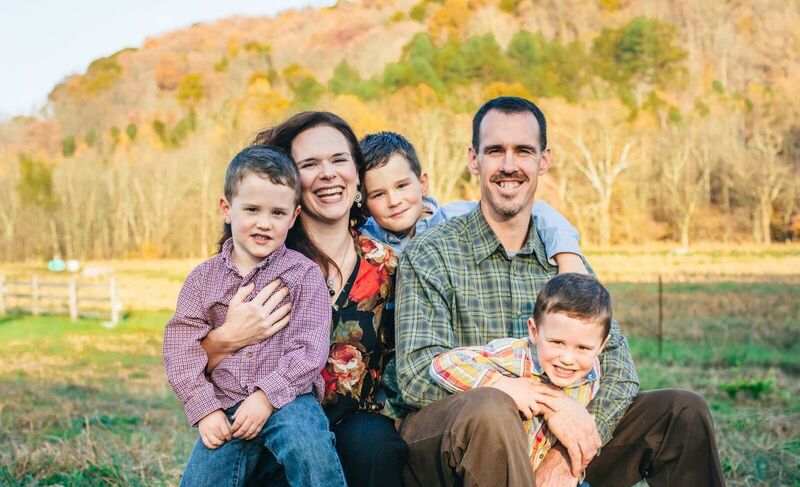 They credit their ability to survive the business of farm life, Amanda’s full-time educational career off the farm, and parenting three amazing boys to God’s abundant love, expressed through the support of family and His extraordinary creation.